Please see attached pic file (this time it successfully uploaded). I have two scissor trusses about 15 feet apart over a church sanctuary built in 1800s. The bottom chord of one truss is fractured. The fracture appears fresh. High winds (65 mph) came through the area. I think the wind pressures, when applied to the roof, tried to flatten the truss, and the truss did not have sufficient capacity to resist the horizontal loading (i.e. thrust), resulting in fractures at bottom chord. In other words, the bottom chords were not strong enough and the truss deflected downward. The exterior bearing walls are not pushed out. I realize 65 mph should not kill the roof structure, but there are signs of prior repairs at the roof framing (sistered rafters between trusses), making it susceptible to damage from otherwise non-damaging winds. Do you agree that damage to bottom chord could be caused by a load such as wind applied to the top chord? I cannot tell much from your pictures, but I will say that nothing there looks like a scissor truss. It looks like they tried to "scissor" 2 rafters as an attempt to tie the sides of the roof to each other. From the little I can see in your pictures, this appears to be more "stick built" than truss. Interesting. The scissor trusses are widely spaced, with members spanning between them to pick up the rafters in between. Are you sure the trusses did not get overloaded this past winter? With Duration factors in mind, I'd have to agree with Dave. a 65 mph wind gust isn't all that high, and with the 1.6 duration factor for wind compared to the 1.15 for snow, i'd think its more likely the member was over stressed from snow, or another longer duration load. Where in the country are you? does snow buildup occur on this roof? Its also interesting that the failures are consistently on one side of the truss (if im looking at the pictures correctly). This does somewhat contradict what I say earlier, and points more towards wind. The higher duration factor relaxes the limits on stress so a wind force condition allows HIGHER stresses on the lumber - all this of course for design. For reality, wood is stated to have a higher resistance to short term loading than to long term loading so short bursts of wind stress may not be an issue. You'd have to analyze the framing to see what effect the wind might have. Also - very very old wood here so some long term deterioration might have occurred either by moisture exposure or to hot attics over drying the wood and getting it more brittle. Since it appears that the split or break happened on the same member, at the same location, and on the same side of the center joint, it would likely have been caused by a one sided/imbalanced loading of some sort. One of those bot. chord members is going to tend to be in compression and the other in tension, or at least large differences of member force, to counteract the roof loading and the attempted truss deformation. This likely also sets up something of a moment/couple in that center joint, and the fasteners had insufficient edge distance in the broken member for the load which was put on them. You should look at all the connections on all those bot. chords for adequacy. Are the broken bot. chord members still pretty well aligned, or are they displaced, a straight edge on the top edge of the member will show this, one side w.r.t. the other side? Your first photo seem to show this type of offset displacement on the broken member. Could you jack up from below, or pull up from the ridge beam to glue and close up the crack? Then, sister a new like sized member on the outside of each of the bot. chord members. This time give a little more thought to how that center joint works and moves. Maybe add a king post and/or a tension rod to the ridge beam. The trusses appear to have been trying to rack to the right in your photos. We really need to know a lot more than we know, or see, right now. And, you should certainly do an analysis of the truss arrangement before and for the new one. Has this had multiple modifications and repairs? Is this 2 separate roofs with different pitches? It looks like a lower set of rafters that was originally decked. Most likely, there were no ceiling joists or the joists were removed later. Then it appears a 2nd roof was added over it. The 2nd roof has a steeper pitch. The scissor-looking "contraption" looks like an attempt to connect the 2 roof planes to each other via scissored rafters because there are no rafter ties and I do not see a ridge board or ridge beam. I doubt a 65 mph wind would overcome the DL of this roof but it could cause and unbalanced load. Ron, don't you think the scissor trusses and darker rafters were original, with the lighter colored rafters added later? There is a darker colored horizontal member halfway up the slope that picks up load from the intermediate rafters and carries the load to the scissor trusses. It may be confirmation bias (you spin a fine yarn) but I do indeed see a mechanism for the failure that matches your hypothesis. Peaked trusses without king posts are susceptible to chord bending fracture in a unique way. Whether that's a product of snow or net inwards wind pressure, I really couldn't say based on the information presented. Good catch, Kootk! The truss configuration is unstable. But I would have thought that the absence of a king post would result in the walls pushing out. I think it is 2 different roofs. I am basing it on the pictures. Why is the lower slope decked or sheeted? I cannot see the lower members of "the scissor". 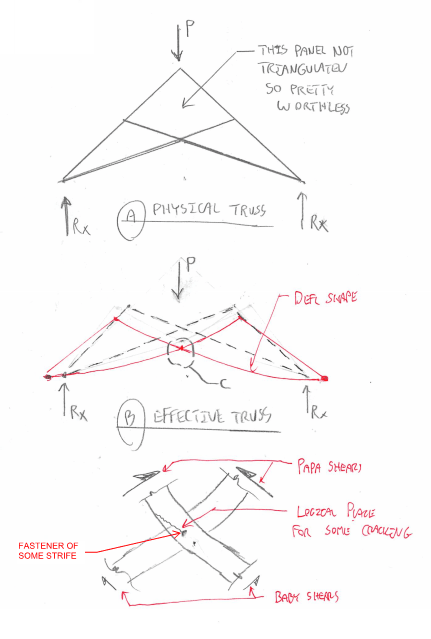 Most of this thread is serious discussion about scissor trusses but even if these were 2 true scissor trusses, how does the rest of the roof loads get to them? The upper roof has rafters that run to the peak, not laterally. There is an "underpurlin" but I cannot tell if there is a ridge beam or not. Pictures are not clear enough. If the underpurlin is steel, that also indicates a repair to me. The post said this thing is old. As KootK pointed out, you have that 4-sided peak. Different wood color, kind of indicates built at different times. Yeah, that makes it worse and might be a feather in the cap for PSU's wind theory. Out in the wild, I feel as though unbalanced wind pressure is a more common occurrence that unbalanced snow load. ...you do such good drawings. Thanks. It actually took me six iterations to get deflected shaping looking plausible. By the time that I was done, I felt foolish for not just firing up risa and pumping it out that way. Would have been much faster. But I would have thought that the absence of a king post would result in the walls pushing out. There is that. Perhaps it wouldn't take all that much movement to initiate such a brittle fracture. I took a quick look at those pictures and thought, "I just don't get what I'm seeing here vs what this guy is saying." But, as soon as I saw your sketches, the behavior seemed so much clearer. You're most welcome. You guys is making me blush. Fixed a similar situation in a church a while back, but trusses were 24" or so on center. Put tension cables from eave to eave to pull the walls in and make the trusses work as arches. This was a wood stud building with brick on outside. You said the walls were not pushed out? If they are solid masonry with enough mass to resist the thrust, the roof is probably acting in arch mode. Maybe why if is still standing since the 1800's.